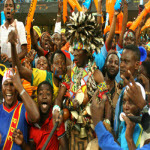 The Democratic Republic of Congo has announced its intention to bid to host the Africa Cup of Nations in 2019. Despite having twice won the trophy, the vast country has never staged the continent's greatest sporting event. Nigeria said it would bid for the tournament last September, while Liberia, Kenya, Zambia and Algeria have also indicated a keenness. Knowing nothing short of a win today would see them through to the knockout stages, DR Congo came flying out of the traps and took the lead through Dieumerci Mbokani's penalty. But Samassa equalised in the 13th minute and while both sides had chances to win the match, they had to settle for a draw as Mali sealed their passage from Group B alongside Ghana. 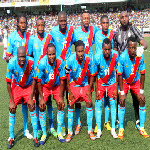 DR Congo will have to win their last Group B match against Mali on Monday to qualify for the quarterfinals of the Africa cup of nations. The Leopards were held to a goalless draw by Niger on Thursday in a game of missed opportunities. 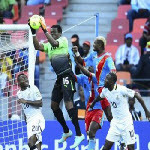 DR Congo and Ghana put on a thrilling show on Sunday in their Group B opening match at the 2013 Africa Cup of Nations in South Africa. The Leopards came from behind to draw 2-2 with the top-seeded Black Stars at the Nelson Mandela Bay Stadium in Port Elisabeth. The Democratic Republic of Congo might finally be able to recapture their former glories thanks to the unifying influence of their French coach Claude Le Roy. Recent success has been in short supply, with their best showing at the Nations Cup in recent years being a third-place finish in 1998. 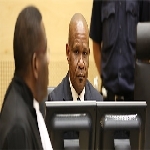 The International Criminal Court acquitted Mathieu Ngudjolo Chui of the charges of war crimes and crimes against humanity. 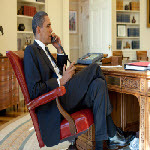 The decision was taken unanimously by the Chamber composed of Presiding Judge Bruno Cotte, Judge Fatoumata Dembele Diarra and Christine Van Den Wyngaert. Judge Van Den Wyngaert filed a concurring opinion. 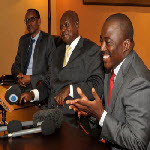 Baudoin Ngaruye and Innocent Kaina are being designated for their involvement in the recruitment and use of child soldiers in the conflict in the DRC and for being leaders of a group that is impeding the disarmament, repatriation, or resettlement of combatants. 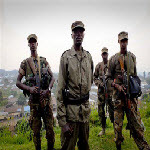 The Security Council extended the arms embargo and other sanctions imposed against armed rebel groups in the Democratic Republic of the Congo, while expressing its intention to consider additional targeted sanctions against the leadership of the M23, the rebel fighters that recently occupied the eastern provincial capital of Goma.